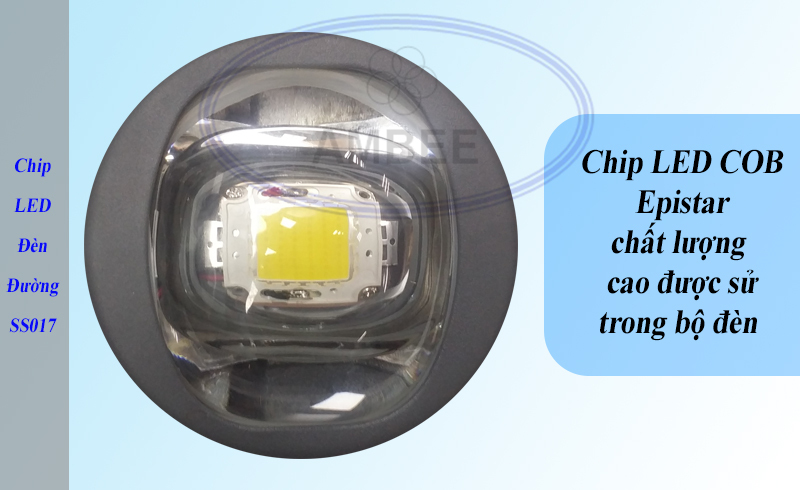 - LED Chip: LED street light SS017 uses high performance COB LED chip, this type of chip is specialized for high power LED, the life of this chip is good, but large dependence and radiator and power supply. Each COB chip has a standard capacity of 50W, so the heat radiated locally. If the heat dissipation is not good, the LED chip will reduce the brightness and decrease the color very quickly and can cause chip flow. 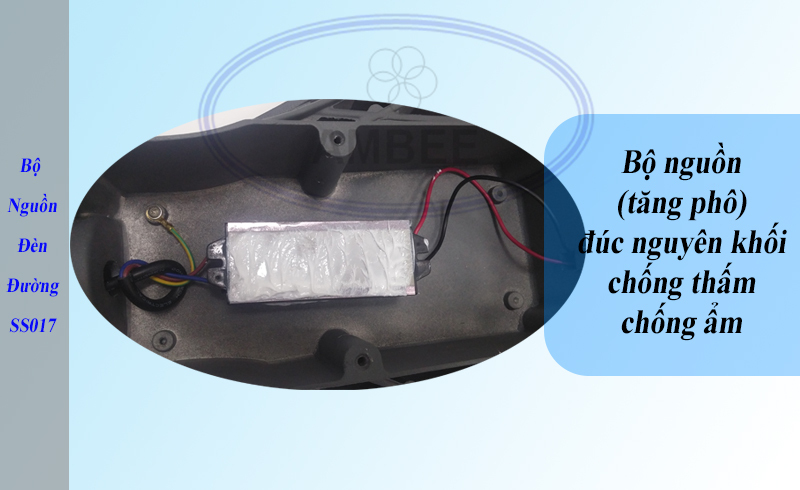 - Ballast: This is the second important part of the LEDs, which helps the LED chip operate stably, without interference. In addition, the life of the LED chip depends on the source (source). Therefore, on the market today, the same lamp pattern, but the price and quality are different. Case of aluminum power supply. The cover of the power supply is intended to protect electronic components inside the power supply, avoiding dust and moisture entering the circuit board. What is more special for this product line is the mono-molded power supply which acts as a waterproofing agent and prevents water and moisture from entering the outdoor environment. - Radiator: it determines the life of the chip. LEDs will be dimmed, discolored, or even chipped ... are decided by the radiator. Usually, the LEDs are very large (depending on the designer & manufacture will produce different heat dissipation) - depending on the capacity of the lamp will have different radiators. Aluminum quality makes this radiator very important, if using aluminum often to make the heat dissipation, the ability to transmit heat slowly and long => fast deteriorate chip. But if you use aluminum molding to make heat dissipation, it helps to heat out faster, conducive to heat => make the chip more durable. 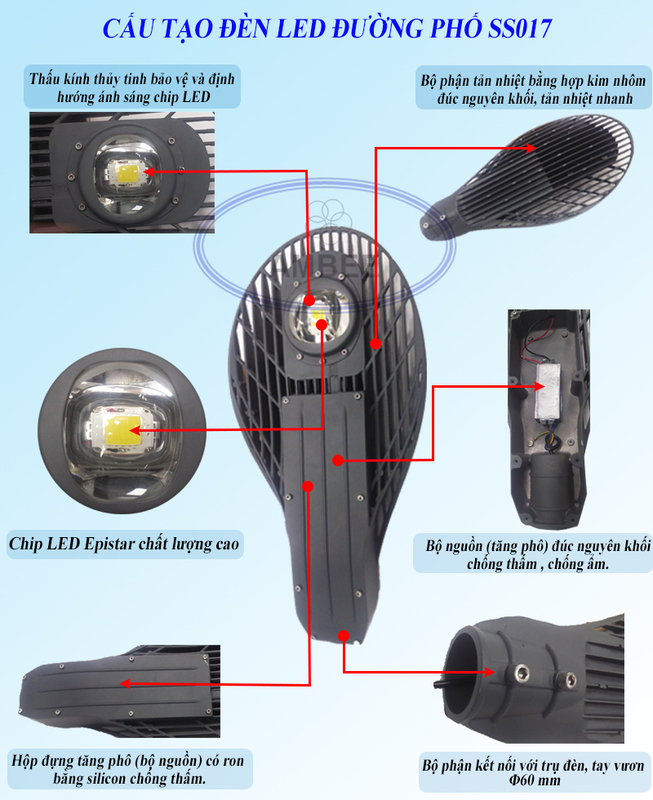 The special feature of this light is that the heat sink is the body that makes up the shape of the lamp, the whole body is molded aluminum and shaped like a leaf with many lines, openings The purpose is to increase the cross-sectional contact of the aluminum surface with air to heat the environment faster. - Ballast box: The bulb holder is designed on the body of the lamp, which complies with IP65 waterproofing standards, with a waterproof silicone surround rim that keeps the container free of dust, permeate or water when operating outdoors. - Connector: This is the part connected to the lamp post which is no less important in the installation process. If the connection is not sufficiently stable, it will be very dangerous during use. 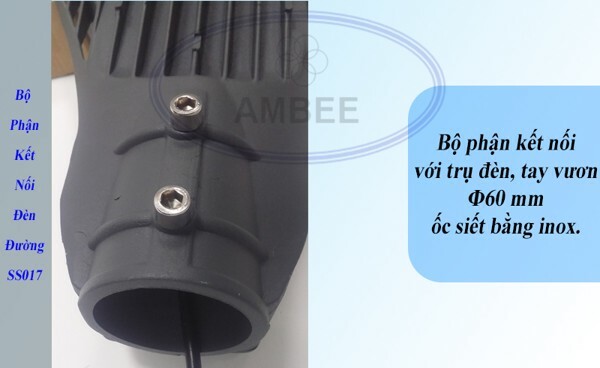 With AMBEE road light products, the diameter of the connecting hole is 60 mm, the screw is made of stainless steel to prevent rust during use outside of rain and sunshine. 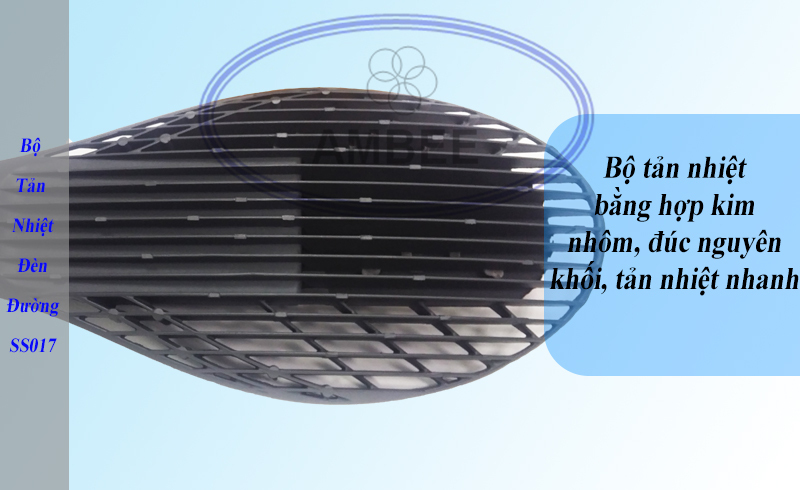 The lifetime of the AMBEE street LEDs is 50,000 hours (2-3 years warranty), while Metal or Sodium lamps last 8,000-12,000 hours. Thus, street light LEDs are 4 times more durable than Sodium - Metal street light. - The brightness of street lights is much brighter than the metal halide lamps. The illumination and lumens of the 50W LED can replace the traditional 120W metal lamp. Street light LEDs have a wide and uniform light distribution, while 120W metal lamps, when illuminated, focus on one point in the middle, the light surrounding the edge is weak => the interference between the two lights is not guaranteed. Brightness for the area to be illuminated. 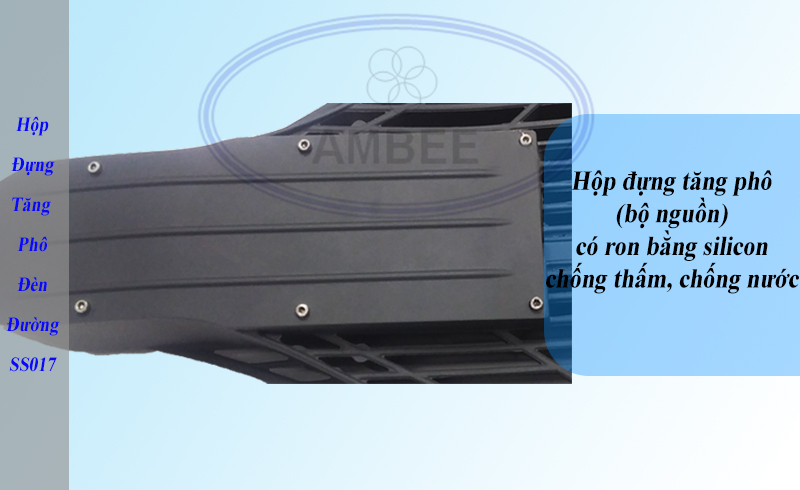 - The street light of the AMBEE street light with 85% color rendering is good for the eyes as well as the illumination of the area, which ensures a safer traffic compared to street light using metal or metal. Traditional Sodium. - With the development of the economy, accompanied by the development of the city's transport infrastructure system, transportation systems in large industrial parks are being developed rapidly. The application of LED lighting technology to public transportation system should be accelerated and strong. - Lighting public transportation systems such as highways, highways, roads in the city. - Goods are checked and thoroughly tested before delivery to customers. - Commitment to change 1 change 1. - Warranty period of 2 years. - Free periodic measurement of light during use (6 months / time). You need to know other products please visit the website or phone us for best advice. 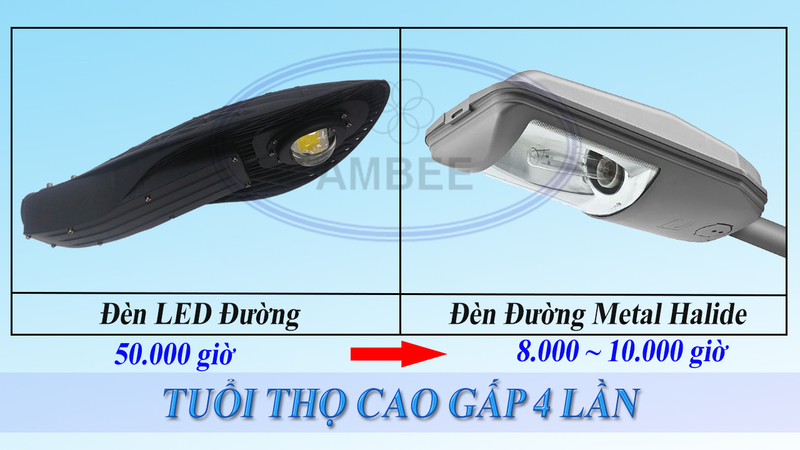 AMBEE Technology Joint Stock Company. - Hotline 0909.780.108 for further advice.